Melinda's Costumes Self indulgence through sewing. Fresh off the success of my bustle for Steamcon II, I decided I’d try stepping it up a notch and make myself an Elliptical Hoop like the ones used to support skirts from a short transitional period between around 1865 through 1870. 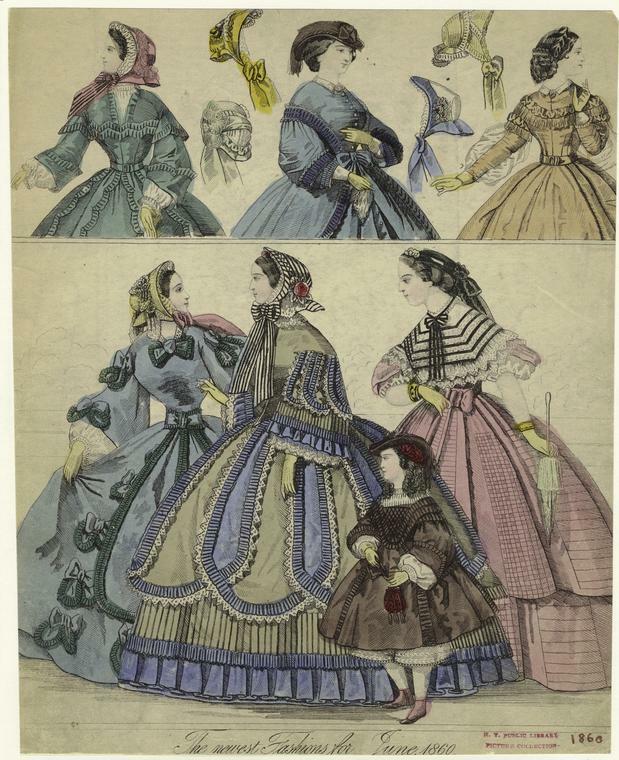 It’s a weird period where you can literally see the fullness of the traditional circular crinoline cages on the 1850’s and 1860’s (think United States Civil War era ladies fashion) moving further and further back to eventually become the bustles popular through 1870’s through 1890. 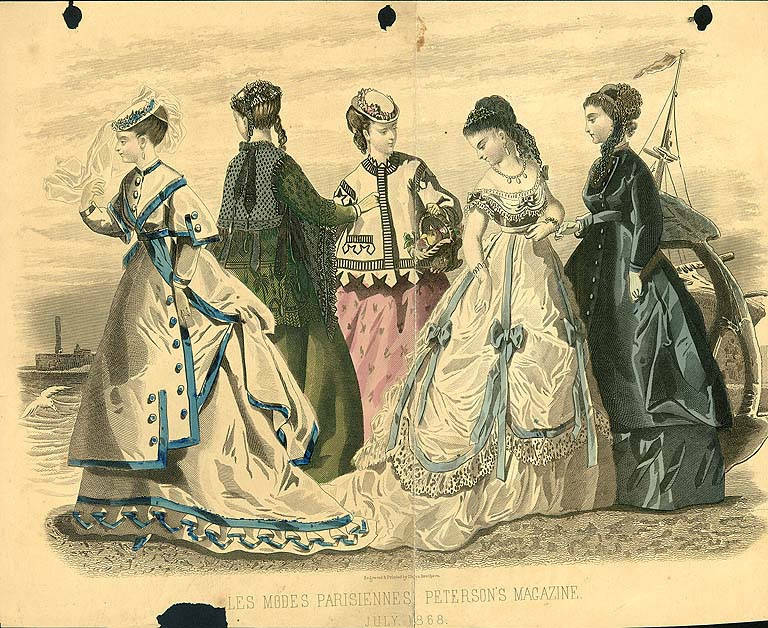 Above is a fashion plate from 1860 showing the circular hoop silhouettes which were popular from the 1850’s through ~1865. 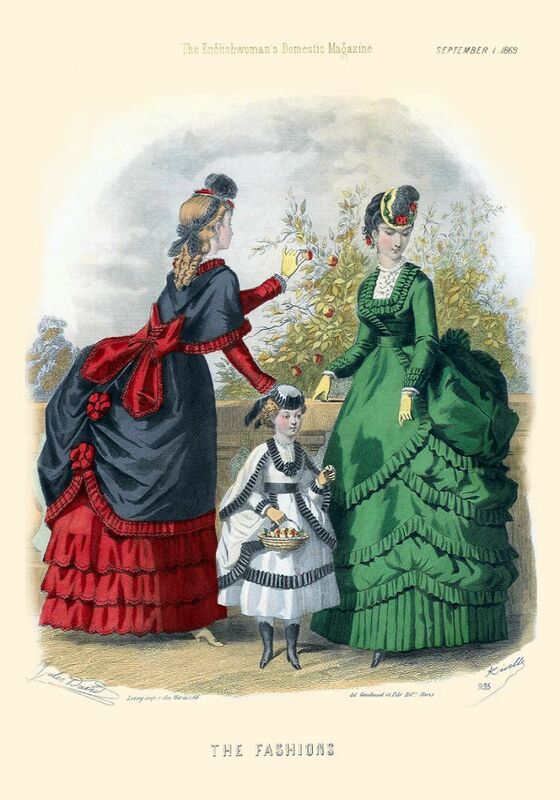 By 1869 you can really see the transition – there’s still more fullness to the sides of the skirts than there is with a lot of later bustle dresses, but the bustle has definitely established itself and caught on. Long story short, I’m pretty damn smitten by elliptical hoop style dresses, so I set about to looking for a pattern to make my own. Again I turned to Truly Victorian (this whole blog is starting to feel like a huge advertisement for TV, lol – but hey, they make GREAT patterns! 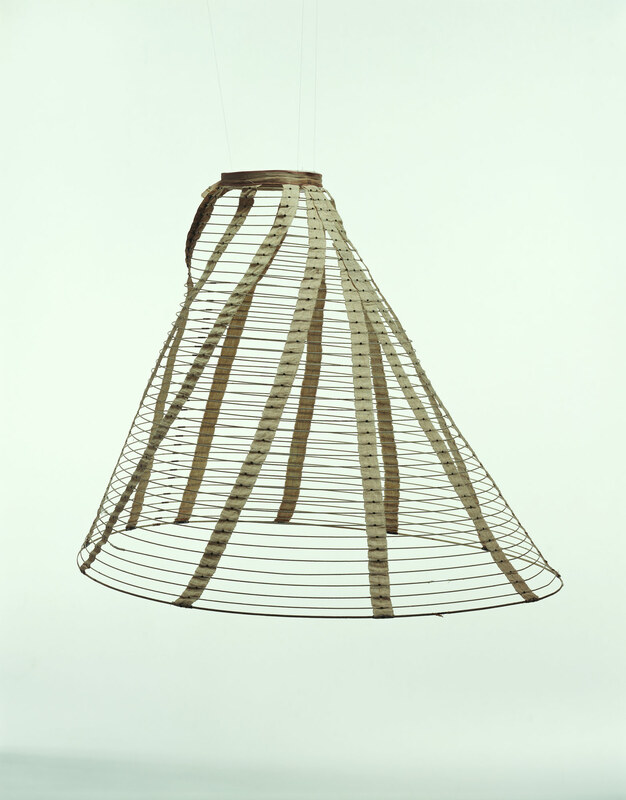 ), and ordered their 1865 Elliptical Cage Crinoline pattern and three 12 yard rolls of hoop wire. It’s using a different design then the elliptical hoop shown above, and uses ties placed at the rear to create the elliptical bustle shape. It also uses fewer stays (hoop wires?) than the historical example. I believe modern hoop wire has more strength than historical wire, but it may just be to save material costs? 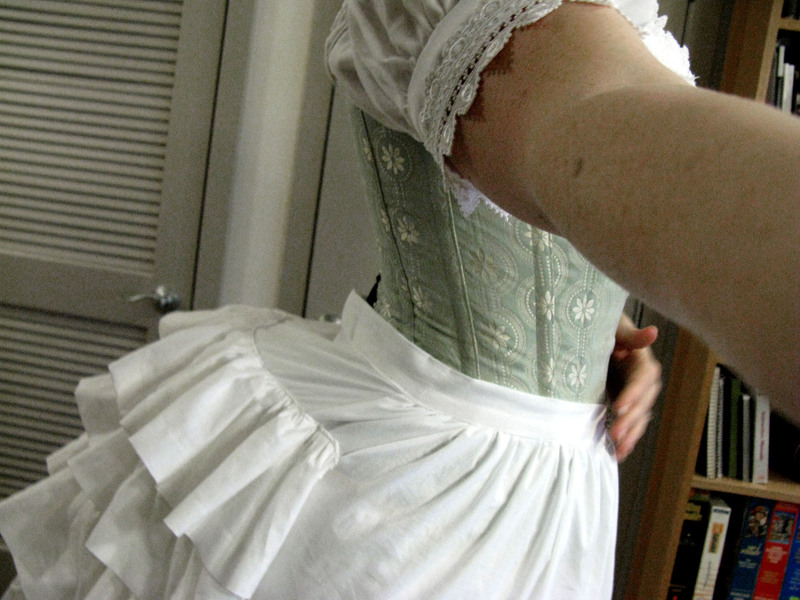 I think more wires may be the way to go though if I ever make another hoop skirt – it’s easier to hide the wires under petticoats if you don’t have huge gaps between each wire. 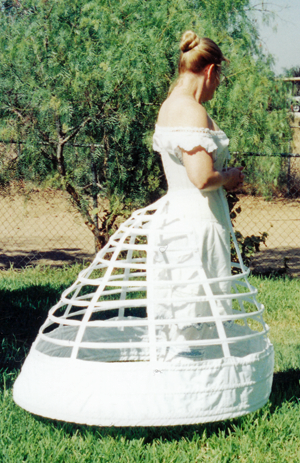 The above photo from Truly Victorian shows what their finished hoop skirt looks like when completed. But I digress. Back to the skirt! This skirt is almost too big to fit in my hallway. 🙂 Almost. Obviously I still need to hem the petticoat, and I think I may add some rows of ruffle to further disguise the hoop wire underneath, but I keep putting it off with the thought that eventually I might buy my sewing machine a ruffling foot, and then wouldn’t I feel foolish for hand ruffling a whole skirt? 😉 It’s faultless logic, really. 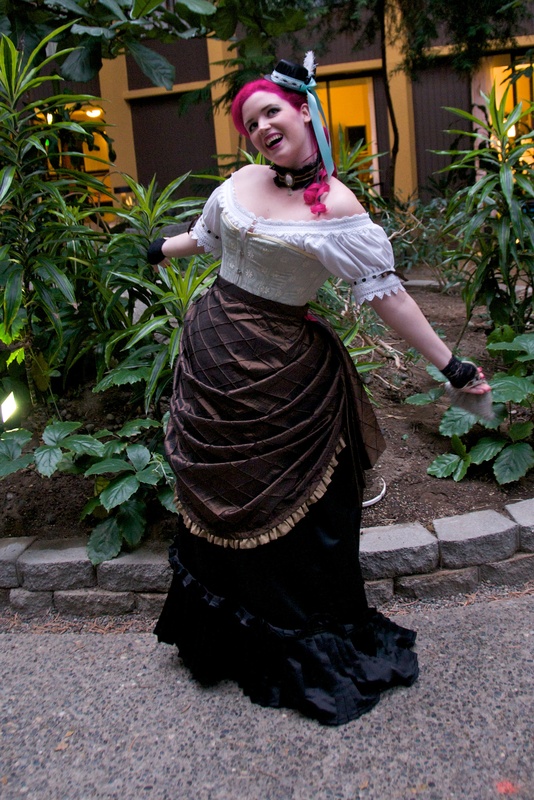 The first project I tackled was a long black skirt to go over the bustle. I figured black would be a good staple, something that I could use in the future with other pieces if I needed to. 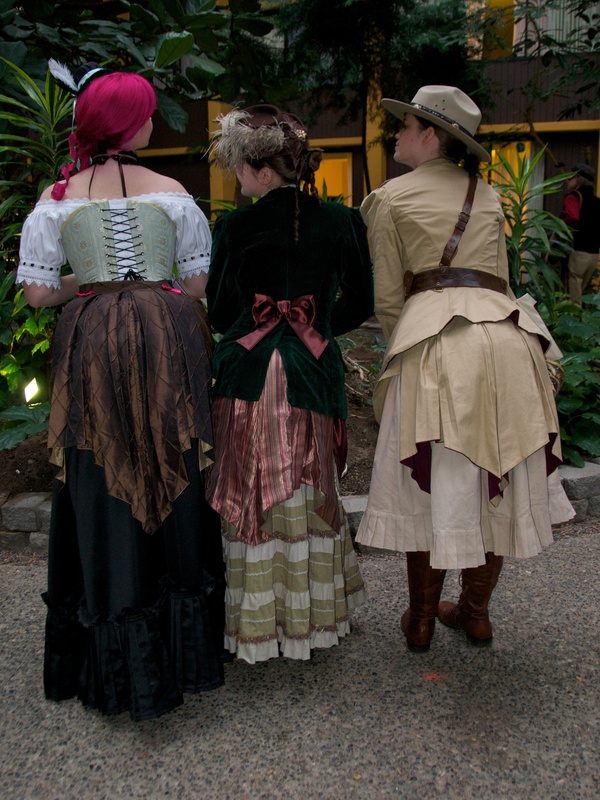 I used Truly Victorian’s 1885 Four Gore Underskirt pattern with pleated back, and added pleating at the hem. The fabric was a black home decorating fabric with a bit of a sheen, picked up again at Jo Ann’s. This fabric was lovely, but was tricky to keep pleated. I ended up making my own pleater board out of card stock, but that’s a subject for another post. I used three rows of top stitching about an inch and a half down from the top edge of the pleats to hold them to the edge of the skirt, but they refused to stay up. When I re-wore this skirt for Steamcon III I revisited this skirt and tacked the top of each pleat up onto the skirt by hand for a more orderly appearance. All that was left was to accessorize! 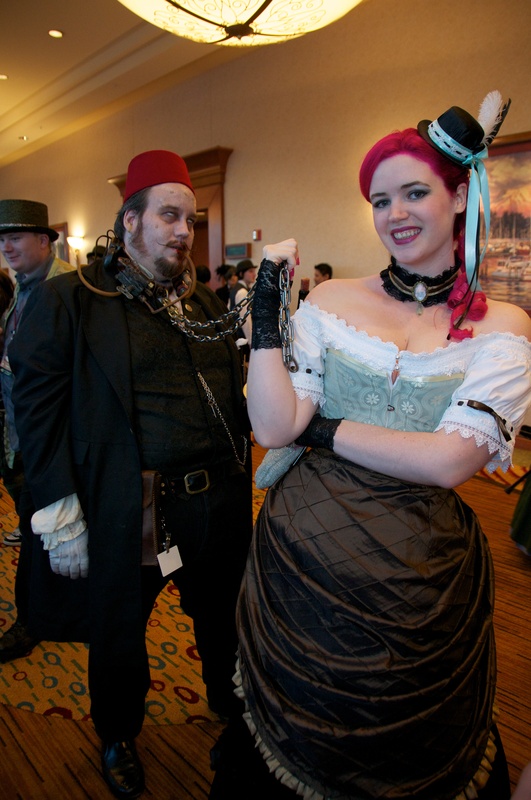 I bought a small black felt top hat at the Ben Franklin Crafts, and Jean helped to cover the hat in matching black satin left over from my skirt and decorate with feathers and ribbon to match my corset. We made asymmetrical stretch lace gloves using a zig zag stitch and some black stretch lace, and made a choker from leftover fabric and lace scraps and a broach from the craft store. 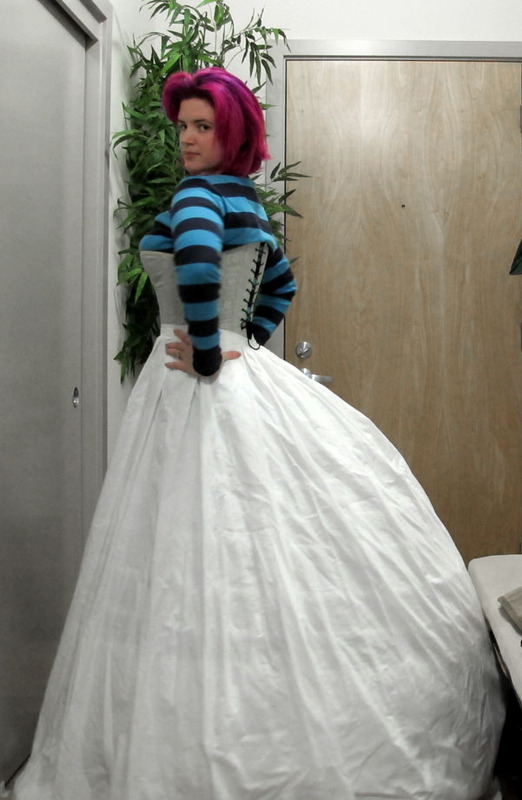 The next project in preparation for Steamcon was to make myself a bustle. 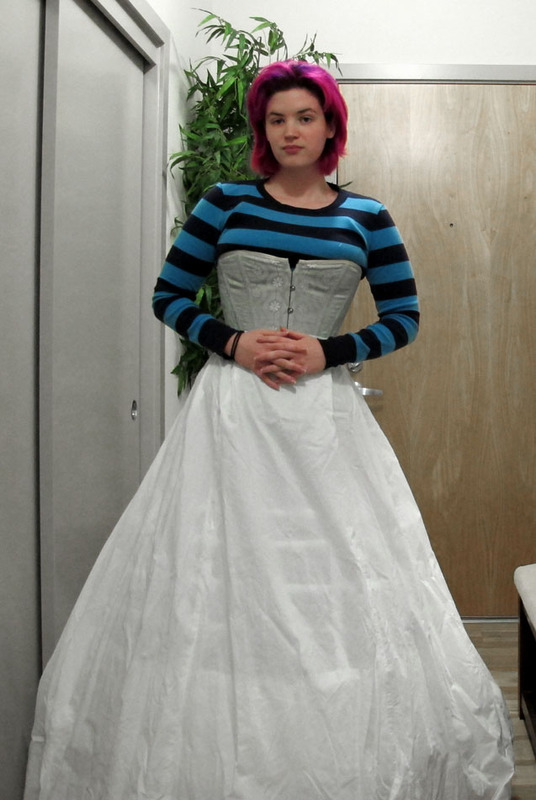 After having such great success with Truly Victorian patterns with my corset, I went to them again for the bustle, using TV101 and their precut bustle wire. This whole bustle went together in about a day and a half, but it would’ve gone much faster if my sewing machine had a ruffleing foot. I think gathering each ruffle was what took me the longest (it was murder on my finger tips, too.) 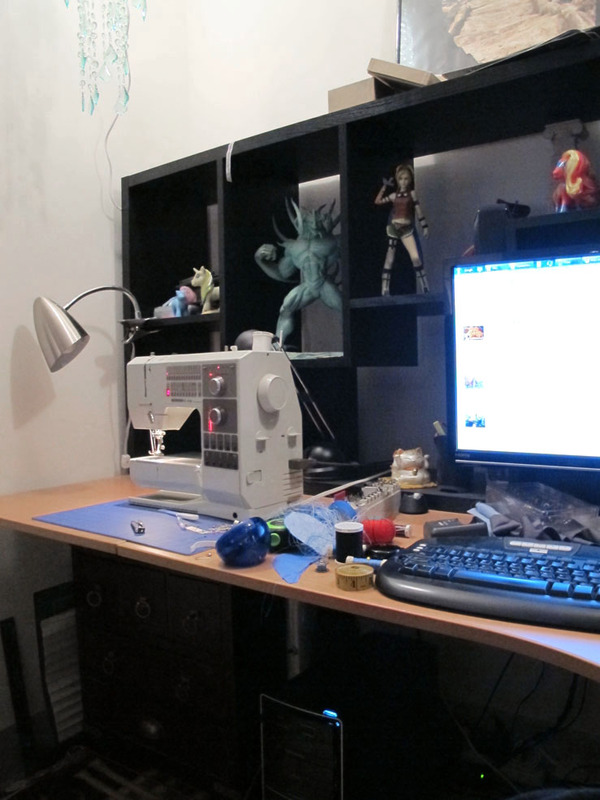 But the result looked great, and you can’t see the hoop wire at all once it’s all under skirts. The bustle is made to be hemmed a few inches higher than your outer skirts to reduce the likelyhood of stepping on it when going up stairs and the like, but it looks a little silly when worn all alone. 🙂 I was also very pleasantly surprised at how easily the bustle collapses for storage and ease of sitting. I’m a 3D Environment Artist currently living in beautiful Bellevue, Washington. I sew, and work on renovating my Mid Century Modern house. Steamcon 2013 Harem Pants, Completed! Hey! I’m not dead yet!